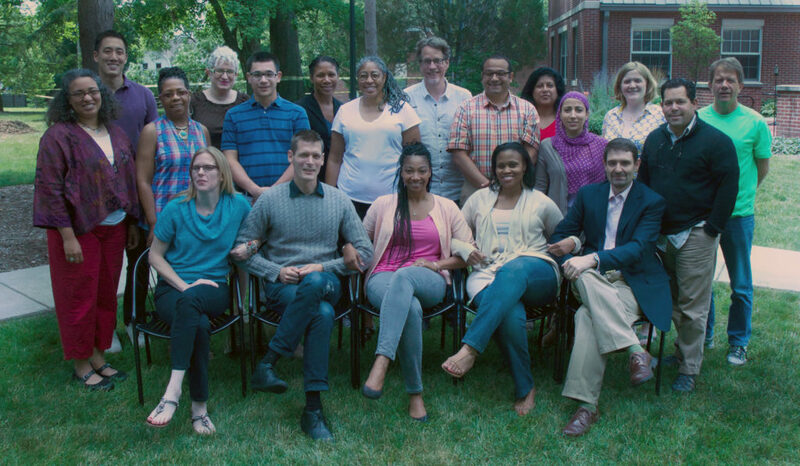 Front Row (left to right): Katherine Shaner (Wake Forest University Divinity School), Devin Zuber (Pacific School of Religion), Eboni Marshall Turman (Duke Divinity School), Lisa Thompson (Pittsburgh Theological Seminary), Robert Heaney (Virginia Theological Seminary). Second Row: Malinda Berry (Anabaptist Mennonite Biblical Seminary), Lynne Darden (Interdenominational Theological Center), Gilberto Ruiz (Loyola Institute for Ministry), *Evelyn Parker (Perkins School of Theology), Safwat Marzouk (Anabaptist Mennonite Biblical Seminary), Najeeba Syeed-Miller (Claremont School of Theology), *Francisco Lozada Jr. (Brite Divinity School). Third Row: Gerald Liu (Drew Theological School), Linn Tonstad (Yale Divinity School), Shanell Smith (Hartford Seminary), *Michael Bourgeois (Emmanuel College, University of Toronto), *Damayanthi Niles (Eden Theological Seminary), Cameron Howard (Luther Seminary), *Paul Myhre (Wabash Center).